This classic Craftsman Mission style armoire has strong, yet simple lines that are distinctly Mission. The popular Mission design will be a style that doesn’t go out of fashion. 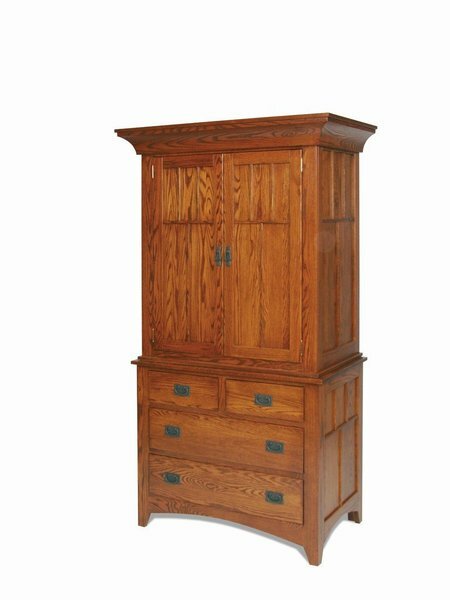 Our Amish handcrafted Mission armoire will be a wonderful additional to any home or office for its warmth, style and quality workmanship. This solid wood Mission Armoire is sure to last a lifetime! This Mission Armoire is well designed and stylish with clean lines, carved panel sides and drawers that show off the solid wood grain. Choose between black or wood Mission hardware. The drawers are dovetailed for years of everyday use. It is available in oak or cherry wood and handcrafted by experienced woodworkers in Lancaster, PA. Give your bedroom the look and comfort of a village inn with the Mission Armoire. This product takes about 8-12 weeks to complete.